If you are looking for a natural way to lose weight and keep it off, Slendarol may be the perfect choice for you. We should first emphasize that this is a natural weight loss supplement. Unlike other diet pills on the market, Slendarol will have no adverse effects on your health. Secondly, we should mention that this is a professional weight loss formula that has been used by people around the world. Slendarol falls into the category of weight loss supplement because it does not rely on harsh stimulants in order to help you lose weight. Rather, it employs powerful natural ingredients that optimize your body’s weight loss efforts. It supplies your body with what it needs to lose weight-things that you are probably not getting through your normal diet. This product is intended to help you lose weight and keep you at your ideal weight. Who is the Manufacturer of Slendarol? This product was developed by Vita Balance Inc which is based in Richmond, Virginia. They have put in the time and effort to develop a powerful weight loss formula that can be used by almost anyone. They state that Slendarol is a safe and healthy way for you to lose weight. Slendarol was developed using good manufacturing practices and has been approved by prevailing authorities. Slendarol works by giving your body the energy it needs actually to lose weight. The product uses a studied and natural formula, so it is guaranteed to work without any of the jitters or energy crashes that common diet pills and supplements are known for. The ingredients in Slendarol help you lose weight by having a natural yet beneficial effect on your metabolism and by supplying you with weight-loss friendly nutrients for optimal results. Slendarol Ingredients – Are They Safe & Effective? The formula for Slendarol is relatively simple, consisting of only five major ingredients, but it is nonetheless effective. Best of all, it is completely natural so you don’t have to worry about nagging side effects. Let’s take a look. Caffeine – Caffeine has been regarded for decades as a weight loss aid because of its effect on energy levels and because it may act as a natural and healthy appetite suppressant. Green Coffee Bean – Green coffee bean can have a good effect on your metabolism by providing your body with chlorogenic acid. Raspberry Ketone – Studies have shown that people who have been provided with a significant dose of raspberry ketone showed better results from their weight loss efforts (exercise) than those who were not. Garcinia Cambogia – This ingredient is a fruit extract which has a positive effect on energy levels. Green Tea – Green tea is a natural source of caffeine which supports healthy metabolism and energy levels. Plus, green tea may assist the user in keeping weight down. What are the Advantages of Slendarol? 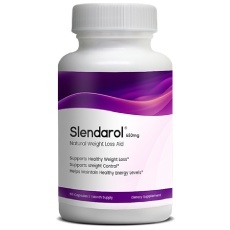 Slendarol is a great way to start your weight loss efforts by providing your body with more energy. The formula used to create Slendarol contains all-natural ingredients. Using Slendarol will help you keep the weight off once you have used it. Slendarol is a trusted product, having been used by thousands all over the globe and very well reviewed by consumers. What are the Disadvantages of Slendarol? There does not seem to be any significant disadvantage to taking this product. Upon thorough research, we have concluded that Slendarol is a safe and effective weight loss supplement. How Should you Take Slendarol? The instructions for taking Slendarol successfully clearly state that you should take two capsules every day with a meal. How Much Does Slendarol Cost? One bottle of Slendarol will cost $27.95. If you choose to buy two bottles, the price goes down a bit to $48.96. 4 bottles is $97.90, and you get a 5th bottle free. What is Slendarol’s Return Policy? You could return Slendarol for a refund if the product came to you damaged, if you change your mind within 7 days of your purchase, and if you return your product within 30 days of receipt. Does Slendarol Offer A Free Trial? There is no free trial for Slendarol but they do offer discount options, a good return policy, and you get one free bottle if you purchase four. Slendarol is a weight loss supplement that promises to deliver real results. It is a good product to try because it encourages healthy weight loss. It is a natural way to boost your energy towards your weight loss goals and to keep the weight off once you have lost it. Slendarol comes as an easy to swallow capsule which makes taking it and losing weight very convenient. This product also comes with a solid return policy, so there is really no risk in giving it a shot. 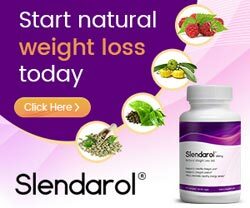 We recommend checking out Slendarol to anyone interested in losing weight safely and naturally.